My new bike came with way or narrow for me 42cm bars. I got these in 44cm width. The gentle flared drops put my wrists in a straight , comfortable position. Both on the hoods and drops. You hardy notice the slight angle of the brake hoods when looking at the bike. But they are far more comfortable than non flaired bars. 1st. Pair went on my cyclocross bike ,loved them so much that I put them on both road bikes! Great on the sprint. I absolutely love these bars. I have wide shoulders and the drop profile of these bars fits me perfectly. The outward cant of the drops is subtle enough to not feel non-roadie (or look awkward). If I had to some up my review of this bar with one word, it would be ergonomic. 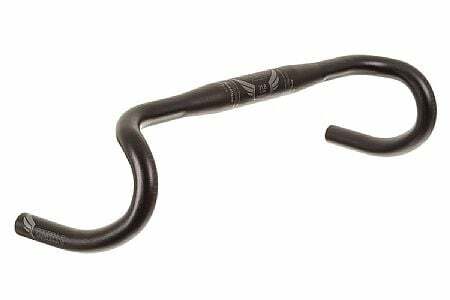 Great price on CX bars with character. I like the shallow drop with flared ends. My brifters angle out where I have them mounted, and I like the different look. It's comfortable, and I get many compliments on the appearance. Second purchase of this handlebar now for carbon gravel grinder after using on my steel winterfenderedtraineradventurecommutergravel bike . I found the subtle flair to be great for drop riding in a more upright position. Does not give the weird brifter angle from wider flared bars (cowchipperwoodchipper) hand positions are familiar and comfortable. Ordered same size width as my regular endurance road bike. Spending more time riding the drops. New bars for the cyclocross rig.1st.cowbell bar. Love them.Going to install on my road & Fixie too ! Why bother with the Cowbell 2? This thing has the same great shape as the Cowbell 2 at a fraction of the price. Feels great in my hands and I love having wide bars for cross top levers. Bought a new gravel bike and inexplicably it came with raked 42 cm bars. How 2cm can make such a difference I do not know but they were awful. The next day ordered these and they are so. Much. Better! Perfect flair, 44cm, and Salsa chic. No rake either. Super happy with them, but that could also be because the ones they replaced were so bad. Got them the next day after ordering too! Of course I do live in Oregon though.